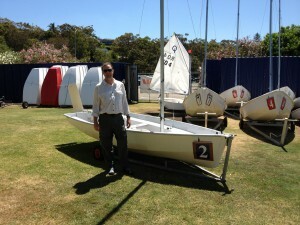 At the end of 2011 Helen and I did the”Introduction to Sailing” course at the Royal Queensland Yacht Squadron at Manly. It was our first experience of sailing, and while a little challenging was ultimately a lot of fun. That said, we both agreed that we would never get into a Pacer ever again. The practicality of having to duck so low, while swapping sides during a tack or gybe to avoid the boom didn’t match with our idea of a relaxing sail. I’ve always been interested in kayaking, but it’s something Helen has quietly let slip as she’s not overly happy with the stability of a kayak. After we finished the course, Helen was looking at various boat options when she came across the Hobie Tandem Island and thought this might kill two birds with one stone. My first reaction when she suggested I take a look at the Tandem Island (TI) was “jack of all trades, master of none”. 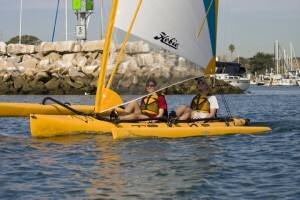 I liked the ability to use it for both kayaking and sailing but was concerned that it might suffer when sailing. After a bit of time spent looking at videos of the Hobie TI in action, especially in some pretty extreme weather in Canada, I reassessed just how capable it might be and I started getting excited by the prospect of owning one. The first thing to do of course was to have a look at one. So one Saturday afternoon we headed off to Sunstate Hobie in Murarrie and there she was, just as great in real life. Unfortunately we couldn’t try one out, but we could take one of the other Hobie kayaks out onto the Brisbane River to try out the stability and importantly the Hobie Mirage Drives. We were both extremely impressed with the drives even to the point of not being bothered peddling upstream against the outgoing tide of the river. But what about trying the TI? Well the team at Sunstate Hobie will allow you to take one for a “test drive” on Lake MacDonald at their Cooroy office, so a few weeks later, off we headed for the 2 hr drive north. After a brief run down on it’s features and how to use it, they first took Helen then myself out for a sail. We were then let loose with it. We had a great time. In fact, for me, it was similar to the feeling I had when I headed off for a ride on my new motorbike. You couldn’t get the grin off my face. Needless to say, at the beginning of the year we brought home our very own TI. I’ve got to thank the entire team at Sunstate Hobie. They answered all our questions, helped with the important issues of who would insure it and on the day we picked her up, spent a long time making sure we not only knew how to use all the features but gave me pointers on towing and putting it in the water at a boat ramp. 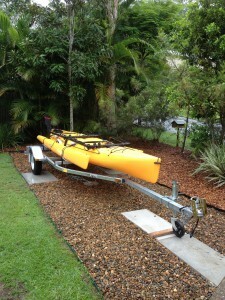 Looking forward to a lot of fun trips in the bay and rivers/lakes around Brisbane and further afield. This entry was posted in SailYak and tagged Tandem Island. Bookmark the permalink. A couple of questions …. Do you always use a trailer or do you sometimes carry it o top of a car? Also, is it possible to securely attach the Tandem Island to its trailer to prevent theft?